ATI’s modular suite of print management software puts you in control of the complete print cycle throughout an enterprise. 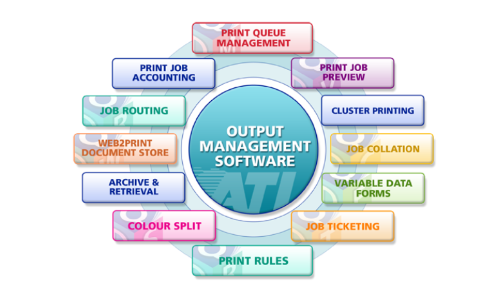 ATI software brings benefits to print job management for both datacentre printing and the central repro print room. Whether simple control over email printing or ATI’s “One Q” solution for print rules between the office and print room, ATI software brings direct cost savings to enterprise output management. In effect an enterprise “universal driver” ATI’s “One Q” solution is the optimum rules based print process for any organisation with departmental “Pull Print” system and an in-house print room.